Polychrome Surface Conservation — Bernacki & Associates, Inc.
Polychrome surfaces are widely enjoyed for their vivid color and artistry. Polychrome is created by layering multiple materials – paint, gesso, varnish, or even metallic gilding – atop a foundation for an attractive laminated effect. Coincidentally, the interplay of materials that gives polychrome its beauty can be an equal factor in its deterioration. Over time, interaction between materials and their base can cause unforeseen incompatibility. Differing qualities of material result in various reactions to temperature and humidity. Loss of polychrome integrity can also come from everyday activity - accidental mishandling, poor storage, or simple wear and tear. Bernacki & Associates combines the skill and necessary knowledge to return polychrome surfaces to their original vibrancy. Understanding of material composition is crucial, and conservation or restoration treatment begins with detailed analysis of subtle properties in both decoration material and substrate base. Flaking paint or lifting layers are stabilized, cleaned, and restored with an expert hand. As with all forms of decorative art, Bernacki & Associates examines and restores the surfaces for prior problematic restoration to avert further deterioration. A thin layer of reversible coating (visible on the left) restores the depth of color and contrast to the painted surface of a historic furniture piece. The paint was blanched as a result of exposure to flood water. After conservation: As seen, the surface was cleaned, structural wood infills were in-painted to match surrounding areas, and a thin layer of shellac restored depth of color and contrast. ... 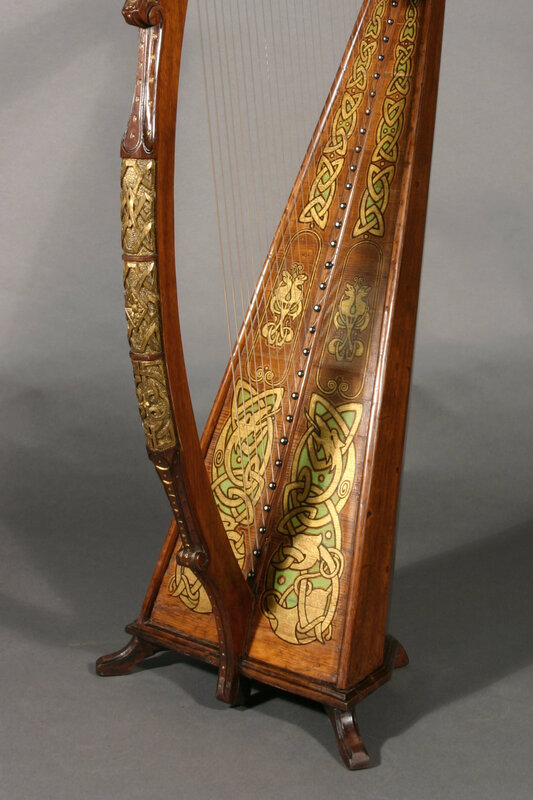 The harp is elaborately decorated with oil gilt 23.5 karat gold leaf highlights. The molding of the neck and the center and side strips of the soundboard are covered. There are gilt shamrocks everywhere, on all of the sections. These are surrounded by gilt lines and culminate in areas of scrolled foliage and abstract decorative elements. The gilding is defined and detailed with black lines. There were many areas of previous repairs to the gilding and black line work but the overwhelming majority of the decoration was original. The gilding repairs were the typical mix of various binders – mainly shellacs and nitro-cellulose lacquers, and various pigments – a mix of mostly copper alloy powders in various stages of oxidation and some areas of possible gold or mica powders. The touch-ups were the typical lower skill level than the original and often covered or confused existing original elements. Over all the harp’s finish was stable, bit dirty and in need of a cleaning of dust and grime.